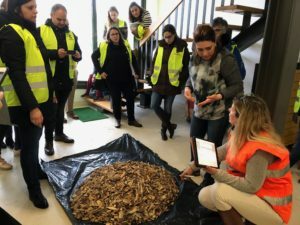 First pilot audits have been conducted already where BIOMASUD partners are checking the improvements made to the previous version of the quality and sustainability certification scheme. Major changes are the new biofuels included (olive tree & vineyard prunings, walnuts and pistachio shells) and sustainability requirements which are being improved and putting in line with the new RED directive which negotiation is almost finished a shorty will be published. In Italy, has been carried out a long path for the selection of the companies potentially interested to the activity. From the end of September 2017 when was realized a workshop with producers of solid biofuels, to middle March 2018 when the first audit has been realized, AIEL contacted and explained the project to about 50 companies, which could potentially meet the certification requirements. Among these companies the most suitable for this purpose have been selected and first audit was carried out with the one that best adapted to selection requirements (interest in certification; attention to the quality; production of a biofuel with a potential in the national territory, etc.). Eco Combustibili Biom Energy is an ENplus® certified company, and in addition to pellets they produce and distribute a wide range of solid biofuels (nutshells, almond shells, walnut shells, fruit and olive kernels, blends), both bagged and bulk. The audit in Eco Combustibili Biom Energy was carried out on March 14th by ENAMA, a Certification Body, accredited by Accredia for the concession of the product certifications related to solid biofuels from agro-forestry processes, in accordance with ISO 17225:1 and UNI EN 15234:1 standards and its special parts. In addition to checking the documentation, the plant and the biofuel sampling, the company and the inspector, based on their experience, have also commented and reported some comments to the latest version of the handbook translated by AIEL. The company mostly focus on the characteristics of hazelnut shells, they mostly agree with thresholds set up within the project. For what concerns the particle size, they report a possible problem in the evaluation of fine fraction, certainly a threshold standardized to the pellet could simplify the internal quality monitoring. Regarding moisture thresholds, they would like to suggest an higher limit at least for the A2, this because when humidity rise up in winter the biofuel tends to increase a bit the moisture content, and since the thresholds for A1 and A2 is pretty restrictive (M12), you could have a lot that switch from A1 to B in different periods of the year. With an intermediate thresholds for A2 at list the variation occur from A1 to A2. The company also produces blends between hazelnut shells and olive stones, they are interested in the certification even for this kind of product. However, they see as a limit the impossibility of communicating quality through classes, easily recognizable by the final user. In conclusion, both the Certification body and the Company are interested in the certification, even after the end of the project, and it is precisely with this perspective they made the comments to the handbook. The audit didn’t show major non-conformities, and the inspector was quite sure that with some little corrective measures the company could be certified Biomasud, once the outcome from the laboratory will be available and positive.